Wow....April 1st!!! Can you believe it? We are finally getting some spring like weather. It is suppose to get into the 50's today...yeah! I am SO ready for warmer weather! Today I have another Easter project to share with you. I used a lot of Jaded Blossoms products on this cutie and couldn't wait to play in their current Easter challenge. This was such a fun and easy project and I am sure the girls at the coffee shop will love them :) They are always so sweet to me when I come in so I can't wait to give them a little something to brighten their day!! I cut out this sweet Bunny Belly Box from the Silhouette Store # 75114. I used papers from Pebbles~Garden Party collection. After cutting out the pieces on my cameo I did a little inking around the edges for some dimension with TH victorian velvet. Sherrie ~ Oh this bunny is so CAAUUTE too! Well you had me at gingham!! LOVE that paper and all the details are simply FABULOUS!!! I know those coffee shop ladies seriously ADORE you ~ you are always thinking o them~ you really are so sweet and kind! Well ~ we need warmer weather too ~ its trying here!! OMG Sherrie this is too cute. Love the papers, the bow and the stamped sentiments you attached to the candy. They are really going to love these at the coffee shop. Would love to have you op on over and link this cutie up over ar 2 Creative Chick. I just love this adorable little gingham check Easter bunny treat holder! Aren't these the cutest boxes ever! I love the patterned paper you used it makes it so fun! So so cute! Love this Sherrie! Sweetest thing! Another amazing project! Love that bunny belly box, the papers you used are gorgeous! And such yummy treats too! Have a great day! This is too adorable. I'm sure the girls will love these. OMYGOSH!!! Sooooooooooo cute cute cute! I loveeeeeeeeee this!!!!!!!!! So cute! !I love the pattern paper used! New Skittles Colors Just Released! That is one cute bunny and love the papers for the treat box! So cute, I'm loving this challenge as everything is so pretty. Thanks for linking up with us over at myshericrafts this week. I'm sure the ladies loved it. Eekkkk!! This is adorable! 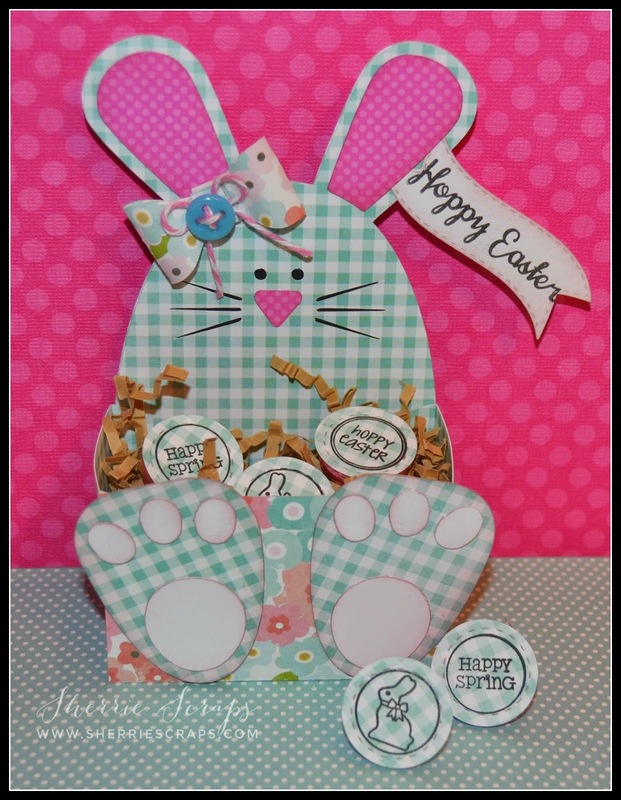 Love the patterned paper for the bunny! Great job. Thanks so much for joining Jaded Blossoms Monthly Challenge!! Love it! Thanks for playing along in the challenge! I have to make one of these, they are just adorable, gr8t job with yours! This is just a Fabulous little bunny!!! A super cute treat!! THis is SOOO stinkin cute! The paper choices are fabulous! Thanks for playing along at Jaded Blossom! Awwww this is adorable! Aren't you just the nicest customer to give these at the coffee shop!!! Have a wonderful holiday! Wow - I am in love with the utter cuteness of this!! Love all the patterns and designs!! Well done - so glad you joined us over at DoubleClick for the Funny/Punny challenge!! such a cute bunny box !!! and the candies look perfect in it !! great job ! thanks for joining us in the challenge this month at Jaded Blossom !!! This is absolutely adorable! And yet it also shows a high level of skill and attention to detail! I really like how you made the bunny out of patterned paper, which gives it such a great vibe! And that bow with the button and twine is incredible! This made me want to quite my job and come be one of the "girls at the coffee shop." Not sure who they are, but if they get one of these bunny boxes, count me in! You really did an incredible job and I'm so glad you shared your skills with us for this week's Simon Says Stamp Monday Challenge Blog! 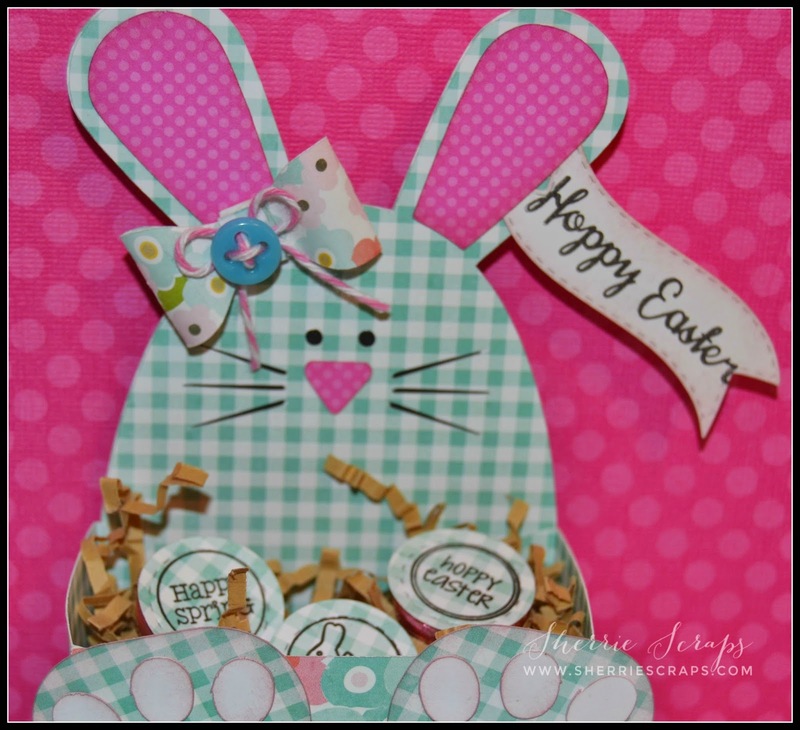 SUPER DUPER job with your Easter project Sherrie, it is ADORABLE my friend!!! Thanks for joining the challenge over at Jaded Blossom!!! Super cute Sherri- glad to see you over at the JB monthly challenge. This is the cutest bunny box ever!! Thanks for playing along at Jaded Blossom! Soooooo freaking cute! I'm sure the girls loved it. I love all of the details. Thanks for joining the challenge at Jaded Blossom!!!!! Such a cute bunny basket!! Thanks so much for sharing with us at FCCB this week! Oh my gosh I can't believe I missed this adorable bunny! Look at those big bunny feet - SO CUTE! You are such a sweetie, I think I've told you that because of you I bring in little treats to the boys at my coffee shop and they just LOVE them! This is such a darling bunny basket! Thank you for joining the DoubleClick Skittles Punny/Funny Challenge!